Omg, this is so good! I bought this ENORMOUS papaya for $1 and couldn't decide what to do with it. 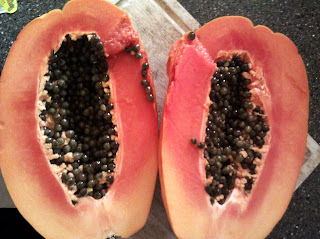 William and Doug don't eat much so there would have been a LOT of papaya for Aldous and I to eat! Put all the ingredients except 1/4c sugar and pectin into a large pot. Bring to a boil, boil for 5 minutes, stirring occasionally. Combine the 1/4c sugar and the pectin in another bowl. Slowly stir them into the boiling fruit mixture, return to a vigorous boil for 2 minutes, stirring continuously. By continuously, I mean, stir every 10 or 15 seconds, so you CAN do other stuff, too. Cutting up the papaya. I probably could have cut these smaller but there was just SO MUCH!! the crystallized ginger. This stuff is so good! dice it really small. All of the ingredients cooking. The fruit turned a much brighter color with sugar and lemon juice. Some of the tiny jars. I've already finished one of these. This jam is unbelievably good stirred into a nice (homemade) thick Greek yogurt. YUM! My steps for cooking/canning jams and jellies: maybe they'll help you streamline or organize your system, if you're struggling. 1. put your biggest pot on to boil with the rack in the bottom. 2. Read thru the whole recipe. 3. Start the dishwasher with the number and size of jars you'll need plus 2 more of each size. Just do the short wash. You don't have to use soap if there were clean jars to begin with. 4. Bring a small pot of water to boil, toss in the right number of rings and lids for the jars you're washing (including the extras). Turn way down, or turn off and cover. 6. While the preserves are doing their 5 minute boil, assemble your jar clamp/tongs, your magnetic lid wand, your ladle and funnel, and assemble on a towel near where you'll have your pot of preserves. 7. Move your preserves close to your work area, and your boiling cauldron to the front burner for easy access. Move the pan of lids/rings closer. 8. Take out 4 jars from the dishwasher and bring them close to the preserves pot. Place the funnel on the jar, and ladle, moving from jar to jar quickly while the jars are hot. lid and ring those, and use the tongs to put them in the boiling water. 9. Do the remaining jars the same way. 10. Once they're all in, dump the super hot water from the lids/rings water into the boiling canner.. If the jars are already covered with water, don't bother. Stick a lid on it, and process the required time. 11. Clean up whatever mess you made. Dry the jars/lids/rings you didn't use and put those away. Load up the dishwasher with the dirty stuff. 11. Remove the jars from the boiling water with the tongs/clamps to a towel covered rack. The towel keeps them from banging into and sliding off of the rack. A broken jar is one thing, but a broken jar spewing hot lava is quite another. Let cool overnight, wash the lids and rings so they look nice, write the date on the lid with a sharpie. VIOLA! you left me hanging after the 2 minutes stirring constantly.. I assume you wanted the jam to be put in jars after that and then the water bath..I hope that is what is to be done as that is what i will be doing..the recipe sounds delicious.